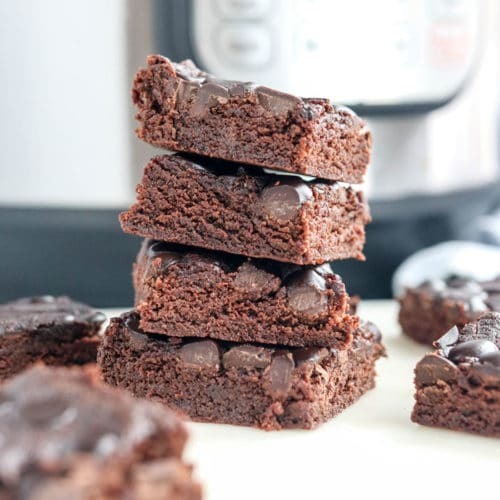 These flourless INSTANT POT BROWNIES are rich and fudgy, and couldn't be easier to prepare in an electric pressure cooker. You need just one bowl and 10 minutes to stir them together. Line a 7-inch round baking pan with parchment paper. In a large bowl, combine the almond butter, coconut sugar, cocoa powder, egg, salt, baking soda, and vanilla and stir well to create a thick batter. Transfer the batter to the prepared pan and use your hands to press it evenly into the pan. Sprinkle the chocolate chips over the top and gently press them into the batter. Pour 1 cup of water into the Instant Pot and arrange the handled trivet on the bottom. Place the pan on top of the trivet and cover it with an upside-down plate or another piece of parchment to protect the brownies from condensation. Secure the lid and move the steam release valve to Sealing. Press the Manual or Pressure Cook button to cook on high pressure for 15 minutes. It will take the Instant Pot roughly 10 minutes to come to pressure before the cooking cycle begins. When the cooking cycle is complete, let the pressure naturally release for 10 minutes, then move the steam release valve to Venting to release any remaining pressure. When the floating valve drops, it's safe to open the lid. Use oven mitts to life the trivet and pan out of the pot. Let the brownies cool completely in the pan before cutting and serving, as they will be very fragile when warm. Store leftovers in an airtight container in the fridge for 2 weeks.